AMG signature driving performance under the open sky. The facelift for the Mercedes-AMG GT S Roadster family shows that you can also improve dream cars. The deliberately refined exterior design, the comprehensively upgraded cockpit and the increase of safety and comfort with new assistance systems make them even more desirable. As before, the impressive sports car technology of the AMG GT can be experienced even more intensely with the top down. The perfect symbiosis of signature AMG Driving Performance and unlimited open-ride enjoyment. The facelift makes the Mercedes-AMG GT S even more attractive with numerous updates. The exterior design is further developed with new headlamps, taillights, side skirts, rear skirt diffuser and wheel designs to further sharpen the roadster's sporty profile. A special acoustic experience is provided by the Selectable AMG Performance exhaust system, now with two chrome double trapezoid tailpipe trims. Two variably adjustable exhaust flaps allow you to change the sound of the vehicle at the push of a button. Depending on the driving program, the sound characteristics change from unobtrusive comfort to maximum expressiveness. A new side skirts design with stronger contouring and additional trim elements makes the AMG GT S Roadster look even more dynamic than before the facelift. 48.3 cm (19 ") / 50.8 cm (20") AMG light-alloy wheels in Y-spoke design matt black with high-sheen finish with FA 265/35 R19 to 9 J x 19 ET61, RA 295/30 R20 to 11 J x 20 ET68. Building on extensive standard equipment, the Mercedes-AMG GT S Roadster offers room for individual wishes. High-performance material meets high-performance car: the carbon-fiber elements for the exterior underline the sporty character of your Mercedes-AMG GT S, and lend your vehicle an even more sporty and technologically advanced look. The benefits of the material from the world of motorsport, namely high strength combined with low weight, are a perfect match for the AMG philosophy. The AMG Night package features selected exterior elements in black with a high-gloss finish. This results - depending on the desired paint color - in either strong contrasts or flowing transitions. Whether exciting accents or sovereign restraint: In both cases, you demonstrate a sense of individual, dynamic design. An interior that is second to none. In the interior, the new AMG DRIVE UNIT with display switches, the new generation of the AMG Performance steering wheel with touch control buttons and optional additional switches, as well as the fully digital instrument display convey a genuine high-tech flair. AMG Drive Unit in Stylized V8 Layout. The center console of the Mercedes-AMG GT S makes the interior of the sports car something very special. The stylized V8 arrangement of the AMG Drive Unit has been further developed with the facelift and supplemented with innovative display switches for selecting various settings. The centrally placed touchpad allows intuitive operation of the infotainment system. AMG Performance Steering Wheel in Nappa Leather / DINAMICA Microfiber. With this facelift, the Mercedes-AMG GT S receives a comprehensive upgrade of the steering wheel. The new generation of the AMG Performance wheel in 3-spoke design comes as standard with touch control buttons and steering wheel shift paddles. The optional AMG steering wheel buttons allow a particularly distraction-free adjustment and modification of the vehicle setup. The control and display concept of the Mercedes-AMG GT S will be expanded to include a number of innovative elements within this facelift. Touch-control buttons on the steering wheel and high-resolution displays set the standard in the segment. The digital displays and animations on the instrument and media display make vehicle functions easier to experience. Familiar strengths such as the intuitively understandable operating philosophy and the high legibility of all displays have been further enhanced. The AIRSCARF headroom heater for driver and front passenger enables relaxed open-top driving at low temperatures, making it the feel-good feature for year-round convertible enjoyment. With air outlets in the headrests, warm air covers your neck and neck like an invisible scarf - arrive at your destination more relaxed. Whether engine, suspension or transmission - the Mercedes-AMG GT S Roadster is designed for maximum performance. The Mercedes-AMG GT S is also available as a roadster a pure sports car. The basis of its elaborate construction is an aluminum spaceframe body. The engine and transmission are arranged in the transaxle principle. It impresses with technical highlights that noticeably increase performance and driving pleasure. With 384 kW (522 hp) and 670 Nm, the AMG 4.0-liter V8 biturbo engine delivers 34 kW (46 hp) more power and 40 Nm more torque than the Mercedes-AMG GT. 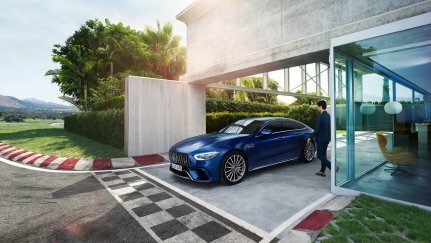 Via the AMG DYNAMIC SELECT Controller, the additional driving program "RACE" can be called upon for the race-track-compatible design of the vehicle systems. The electronic AMG rear axle limited slip differential specifically improves traction and driving stability. AMG Rear Axle Limited Electronic Slip Differential. The AMG SPEEDSHIFT DCT 7G transmission is your ideal partner for a sporty driving style. On request, the dual-clutch transmission excites with extremely fast gear changes, but it also dominates comfort-oriented and barely noticeable shifting operations. So enjoy the best of two worlds - racing or long-distance comfort, you decide! The AMG 4.0-liter V8 biturbo engine delivers up to 384 kW (522 hp) in the Mercedes-AMG GT S Roadster and develops a maximum torque of 670 Nm. Equally impressive is its dry weight of only 245 kg. The aluminum crankcase offers maximum strength and low weight. The two turbochargers are extremely compactly installed in a so-called "hot inside V" formation. The result: optimum response, extremely high torque even at low speeds and improved emissions. With the AMG rear axle limited slip differential your vehicle is even more agile - and you have more driving pleasure. The electronically controlled limited slip differential allows optimum power distribution between the two wheels when cornering. It constantly adapts to the driving situation and increases driving stability, for example, when changing lanes.